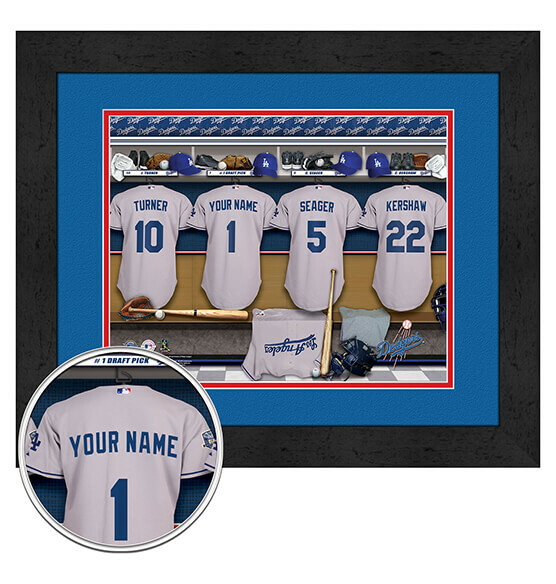 Celebrate the iconic Los Angeles Dodgers with our memorable Personalized Locker Room Framed Wall Art at PersonalizedThings by Exposures. Ideal for the die-hard Los Angeles Angels fan, this Framed Locker Room Wall decor is customizable to include the name of your choice up to 12 characters on the back of one of the four featured Blue Crew jerseys in this charming locker room scene. Purchase this premium wall art that features digital double mat in vibrant team colors, MDF vinyl-wrapped frames, high-quality paper and glass for long-lasting beauty. Whether you purchase for yourself or the dedicated Los Angeles Dodgers fan in your life, you'll undoubtedly hit a home run.